Every day, I scour the internet for news about sharks. When I do this, I will inevitably find something that makes my blood boil, but some of it’s led to positive action (I helped start an investigation that I found out later led to the charter boat Phoenix get fined for illegally taking a hammerhead), and I’m proud of that. When you add the Trumps to the equation, well, things are going to get heated. A little backstory. I grew up on the island of Palm Beach, one of the places the Trump family calls home. A little slice of paradise, sub-Tropical and lush, there are parts of the island as you drive, bike, or walk past, it seems like you’ve onto a deserted desert island. Thanks to the Gulf Stream off shore, the waters are rich and filled with life. It’s also where every year, almost like clockwork, thousands of blacktip and spinner sharks stop to feed as they migrate northward to the warming waters of the springtime Atlantic Ocean. Blacktip and spinner sharks are members of Carcharhinidae, or requiem shark family. They’re muscular, with pointed snouts and sharp well-defined fins, basically the sharks you think of when you think of what a shark looks like. While some in the requiem shark family have been implicated in some serious incidents (bulls and tigers being the most famous), most are just fish-eating, fast-moving, tertiary consumers. While blacktips and spinners have been known to take a test bite of a surfer or fisherman, I don’t know that I’ve ever heard of a fatal attack by either species. Plus, check out these acrobatics! They’re also a favorite of surf fishermen as they’re known to put up a good fight when hooked. The ethics of fishing aside, both species are classified by the International Union for Conservation of Nature (IUCN) as “Near Threatened”, so I don’t know how people of good conscience can continue to intentionally take them for sport. Enter the Trumps. To be fair, I did say “people of good conscience”, which isn’t exactly a “Trump” thing. Sorry folks, I'm just not a fan of sharks – and don't worry, they will be around long after we are gone. But in this case, the shark, per press reports was released – and as we’re all supposed to assume, survived, so mea culpa Donald Trump Jr.! I accused you of killing a shark for sport and I was wrong (except for the two that the fishing guide said were attacked by a hammerhead shark while on the line; more on that in a moment). But does catch-and-release always result in a healthy shark re-entering the seas? No, no it does not. Certain sharks like hammerheads (refer back to that Daily Kos article I wrote above) and smalltooth sawfish get notoriously stressed out when landed and often die after released, after they’ve left the fisherman behind. Here’s a study from the Florida Wildlife Commission on tarpon (a bony game fish) that were caught-and-released, and the confirmed mortality rate there was 13.6%! On bony fish, hook injuries, barotrauma, stress, diminished capacity are all factors in their post-catch demise – elasmobranchs, as they don’t have a swim bladder likely don’t suffer barotrauma, but the other things? Yeah. 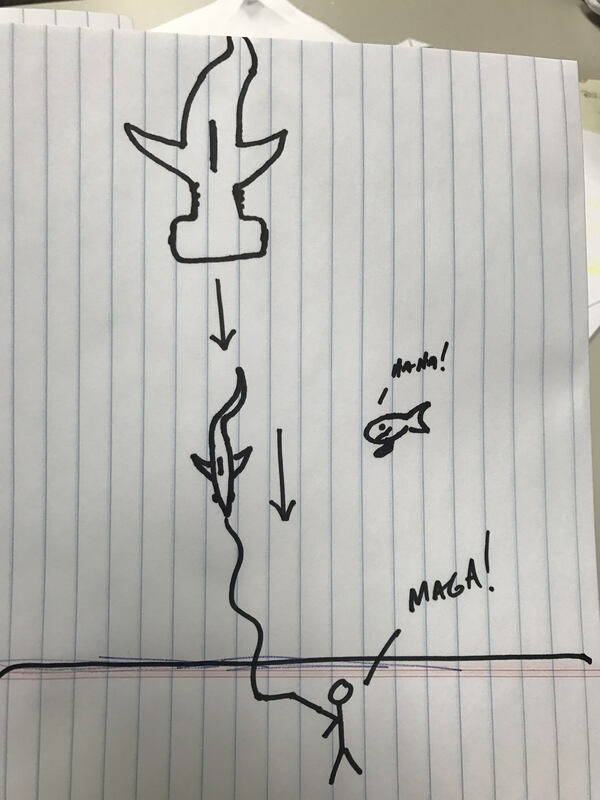 So while Trump caught-and-released (and boy, did I catch hell from fishermen about that yesterday), other than “hope” there’s no way to confirm that the shark lived, and if it was in the kind of torpor that allowed him to grab the shark’s face, I would suggest it’s chances of survival on the low end. Bravo, Don Jr., you’re the moral equivalent of this guy. Nice abs though. But here, the sharks are not hooked and can make use of the full three-dimensional environment. Swim up, down, around, they could even jump into the air to avoid the hammer. When Don Jr. hooked a blacktip, he directly resulted in the blacktip’s inability to avoid its’ hunter, and you know, death. Allow this not-at-all-hastily-drawn diagram to guide you. With Donald Trump Jr. dragging the shark to shore, the shark has one axis it can follow, whereas the hunting hammerhead can hone in on the blacktip and be almost certain of its kill. If two sharks died this way, it’s because the blacktips couldn’t properly evade due to the stimulus of a goddamn hook in their mouths and the drag of a fishing line. Look, as a fisherman, I’ve lost fish to other fish (including in one spectacular instance, a bonito getting cut in half by a very large barracuda), but it’s everything I touched on here is why I don’t fish anymore (from watching a strawberry grouper float away to certain death after barotrauma forced its’ swim bladder out to a moray eel dying as it twisted itself around monofilament). Dr. Sylvia Earle put it best: “Think of them first, and foremost as wildlife… We need to make better choices”. The decisions we make affect the world around us. The loss of 2+ blacktip sharks as sport is problematic in as much as we might see it as “oh, it’s just 2 sharks – that’s not going to lead to their extinction”, but EVERYONE tries to justify it that way. 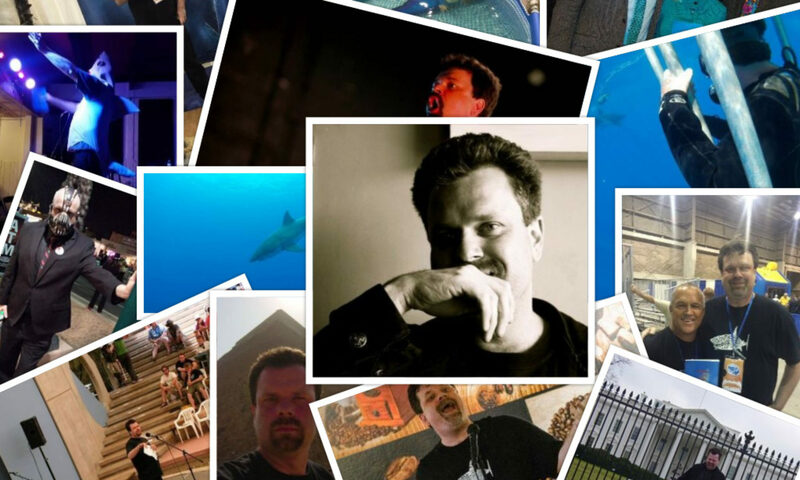 If everyone takes two… You get where I’m going with this. Florida offers some of the finest shark diving in the world. In fact, according to a recent Oceana study, sharks in Florida are worth alive 200 times more than their dead counterparts. Donald Trump Jr. has virtually unlimited resources, and not 30 minutes from Mar-A-Lago is the town of Lake Park where Jim Abernathy of Scuba Adventures could take him to dive with sharks and experience for himself the beauty of being in the water with them. I encourage him to do so to see how valuable, and amazing, these fish are. Bernard. Good article. My gist on the photo of Trump Jr. and the shark was that he was not some “big man” for killing a shark that size. I’ve killed a shark myself back in the Seventies. It had washed up on a beach in Maine and everyone was terrified of it, as it was slashing and snapping at everyone coming near it. No one could get near it to toss it back into the water. Women and kids were screaming. It was all foolishness. It was about the size of the one Trump is shown manhandling. So I hit it in the head until it stopped moving. Then, yes, I skinned it, and used the skin to wrap around my knife handle which made an excellent grip. I was only 19 at the time and I was homeless, on a six month extended “tour” of the country via Thumb Express. (I had to give up the knife in Muldrow, OK, where I was jailed for a night. It was a Marine Trench knife. Very good for multiple uses in and around camp.) I felt bad for the shark but was afraid it would snap some kid’s hand. (My brother had his face slashed by the tail of a supposedly “dead” shark in Florida on a fishing excursion. So I knew they could be dangerous, even when stunned or seemingly dead.) So yes, I did kill it. It was just a “Dogfish.” But it was pretty upset, poor thing. Everyone applauded when I killed it. 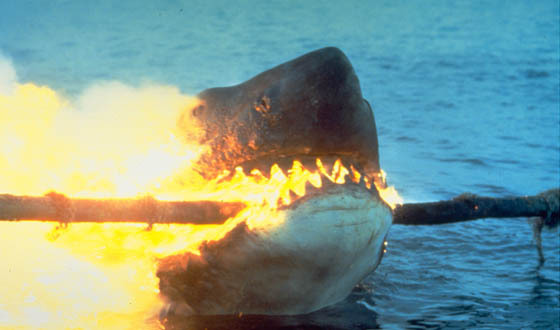 I think Jaws had recently come out and people were just super-silly terrified of sharks back then. (1973?) Since then I have swam (Swum? Swimmed?) with sharks and come to respect them. And admire and even love them. So I was very happy about your article. The thing is these Trump shits keep taking photos of themselves as “Great White Hunters” and it is shameful and shows how egotistical, immoral, and inhuman they are. 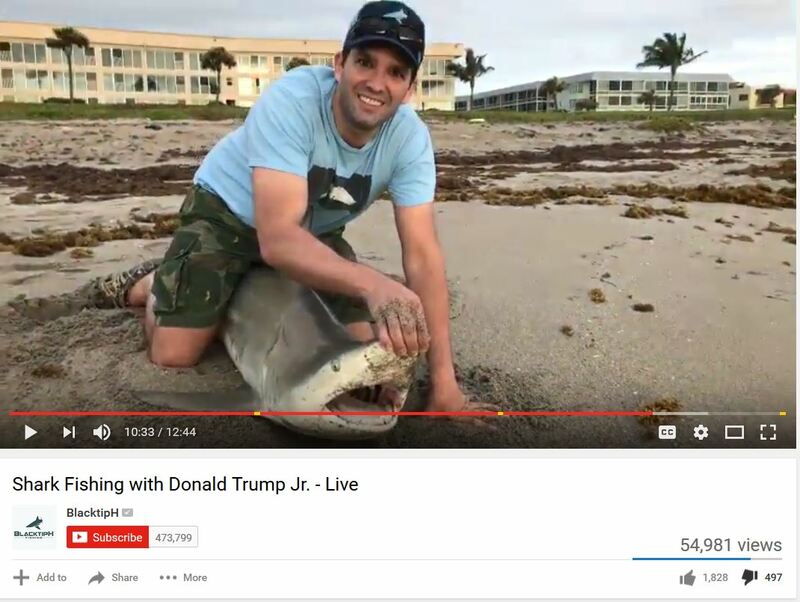 So again, my point was Trump Jr. is no Great White Hunter for landing a three-foot long baby shark and putting his hand in its mouth. Would that it had been bitten clean off! Previous PostPrevious Warning: NEW CONTENT ALERT!